The SharePoint platform has evolved to become a digital workspace and universal interface. SharePoint is being used in support of collaborative efforts of all kinds including co-authoring of documents, information sharing, and an integration point with all enterprise information sources. 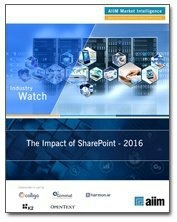 In this study, we find that there is a slight increase over the last year of SharePoint use in an Enterprise Content Management (ECM) and Document Management (DM) role with 28% of respondents citing it is their only (10%) or main (18%) ECM/DM system. However, can SharePoint ultimately be a platform upon which ECM, DM, RM, and collaboration can be built, implemented and expanded? Most importantly, you'll get the information you need to help your organization plan a long-term SharePoint strategy.